Hey there, and welcome to my review of the OMP Passage recurve bow. October Mountain Products makes some great recurves, so I was very eager to get my nephew’s hands on this model (too small for me!) Let’s see how it stacks up against the competition. What’s Included With the Bow? 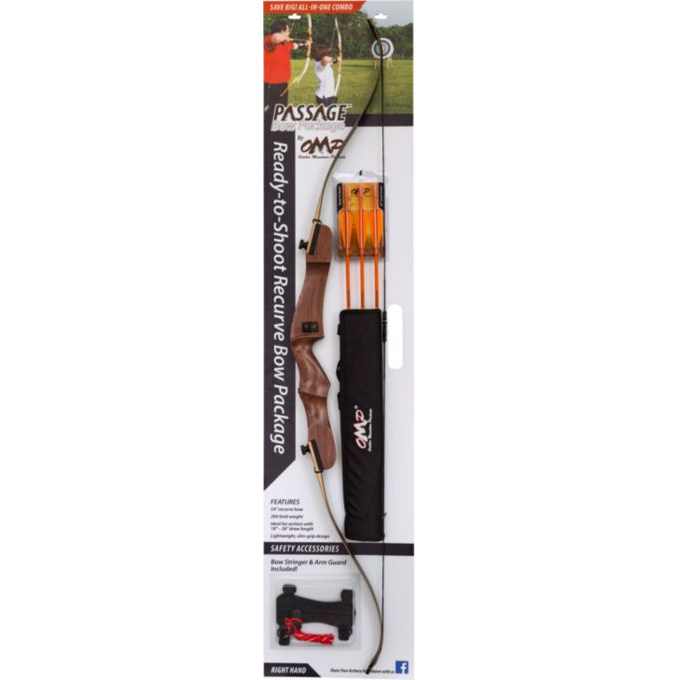 I was pleasantly surprised to see a bow stringer included, since most recurve manufacturers have been leaving that essential accessory out of the box. I took advantage of the opportunity to show my nephew exactly how to use the bow stringer. Is This Recurve Challenging To Assemble? Since it comes out of the packaging already assembled, you’ll be ready to go as soon as you unbox the recurve. You don’t even have to string it, which bothered me at first with the thought of limb twist. Surprisingly, I didn’t notice any problems when I unpackaged the bow. When you do need to take the bow down, unstring it, and then put it back together again, you’ll find the process quite easy to complete. The finger bolts are very nicely knurled to make it easy to loosen and then tighten them for limb removal and replacement. What Accessories Can I Use With The Passage? Since this is a beginner bow, I wasn’t expecting it to be ready for use with any accessories. Surprisingly, however, the Passage is predrilled for the installation of a sight, stabilizer, and/or plunger. It’s usually a good idea to go ahead and install these accessories before tuning your recurve bow, so be sure you’re ready for that. Is The Bow Accurate And Powerful? You’ll need to know that the Passage is only available in a 20# draw weight, so if you or your young archer should be shooting a more powerful bow, you’ll need to choose a different model. If you aren’t sure whether 20# is right for you, head over to our guide on selecting the right draw weight for further guidance. Accuracy is surprisingly good with this bow. My nephew, pretty new to archery, was able to maintain 2.5-inch groupings from 25 yards early on. Is This Recurve Suitable For Hunting? Since it’s only available in 20# draw weights, you shouldn’t use the Passage for hunting. Not only is it illegal in most jurisdictions, the light draw weight simply isn’t powerful enough to humanely dispatch anything bitter than a rabbit or squirrel. Will Beginners Be Able To Learn With OMP’s Passage Recurve Bow? Beginners should be right at home with this model, since it’s designed with their needs in mind. Whether you choose to install accessories on the recurve or not, you’ll find the bow is astonishingly forgiving of poor stance and technique, and it will help your young archer learn the ins and outs of the sport. The inclusion of an arm guard with the bow makes this fact even more true, since your archer won’t have to worry about string slap as he or she is learning the trade. I wish OMP had also included a finger tab, but those are easy enough to make with a simple pattern and a small patch of leather. What Are The Best Arrows To Use With This Recurve? The Passage comes with a trio of arrows, but you may want to buy more. You’ll probably just need simple target arrows, but be sure to check out our guide on arrow selection for more details. How Durable Are The Limbs And Riser On The Bow? The limbs and riser are very well made, and can take a fair bit of use and abuse. I’ve noticed no problems with limb twist, even though the recurve was assembled and strung in the package for heaven knows how long. You shouldn’t have to worry about the bow wearing out before your young archer outgrows it. What Strings Will Fit This Model? 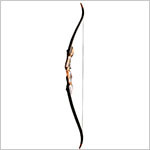 OMP has designed this bow only for beginners, so it’s not compatible with FastFlight or Flemish twist strings. You can use any 54-inch Dacron string, but you’ll probably find that your archer outgrows the bow long before the string wears out. 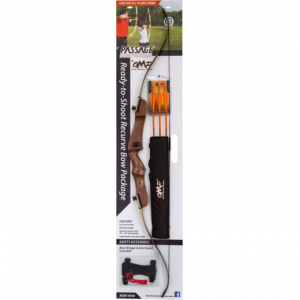 At just two and a half pounds, this is a very light bow and is ideally crafted for 7- to 12-year-olds. It’s short enough for young archers to adapt quickly to, but the brace height is not very adjustable. How Quiet Is The Bow? 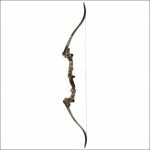 You will definitely hear this bow being shot, but it doesn’t have much vibration or hand shock. After all, it’s just a 20# string and doesn’t have much power behind it. My nephew shot it all day long one Saturday, and never complained of hand fatigue or any other problems with the bow. Thanks for reading my review of the OMP Passage recurve bow. This is a great starter bow, but it won’t be good for hunting. It is, however, terrific for getting someone on the start to going out on a bow hunting trip. 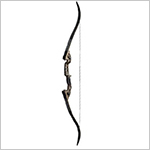 Take a look at current price on the OMP Passage Recurve Bow Review if you’re interested in buying.